On December 14, 1877 25 charter members met in the home of G. Johnson to organize this church and came up with the name Pontoppidan Norwegian-Danish Evangelical Lutheran Congregation. 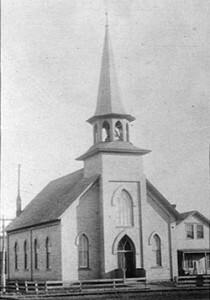 The name was changed in 1878 to the First Scandinavian Evangelical Lutheran Church in Fargo and changed again only a month later to Pontoppidan Scandinavian Evangelical Lutheran Church. The foundation of the church was laid in August 1878 at 415 3rd Street North and was completed in the fall of 1879. It was lost in the fire of 1893.